The Cripto Latin Fest will be the biggest and most amazing Crypto and Blockchain community encounter. Experts, Crypto-Traders, Miners, Crypto changers, Youtubers Crypto, Entrepreneurs, Businessmen, Networkers, Leaders, Investors and all those passionate about the digital age will be reunited. · Contents: Commercial Sample, Business Zone, Food Trucks Zone, Dj Party, Picnic, Conferences, Workshops and Trainings. · Assistants´ Profile: Entrepreneurs, Innovators, Leaders, Miners, Money changers, Traders, Crypto-Traders, Networkers. Crypto-trading, Mining, Investments, ICOS, Leadership, Cryptocurrency legality, Blockchain enviromment, Master Nodes. 2- WHAT ARE WE GOING TO DO? The principal idea of this proposal is to raise awareness of Dash as a payment method among people involved in the event. As a strategy to accomplish our goal, we want to have a stand that will make us capable of providing all the information to fulfill the demands of people interested in Dash. -Giveaways of customized products with Dash Logo (T-shirts, hats, thermos) from the principal stage. Our proposal has the full support of Rodrigo Digital (@DashDinheiro), who will be one of the speakers of this event and has a vast experience in setting up stands and mobile recording studios in conferences. As a team, we will record in English everything related to Dash participation during the event. This project will be executed by an alliance between Brazil, Colombia and Venezuela. Gianpaolo Comparetto: 25 years old, mechanical engineer from Universidad Simon Bolivar in Caracas, Venezuela. He has been in charge of the management of a Mack Trucks spare parts dealer. Experience on project management, Quality Assistant Engineer, Crypto investments, mining. (Ig: G.comparetto. DASH Forum/Discord: G.Comparetto). Mireya Acosta: MBA in administration from Universidad del Rosario (Bogota, Colombia). She has been a leader of Dash Meetup Medellin, active member of Dash Colombia and is an admin of the Trade Academy Group. (DASH Forum/Discord: Dash_Medellin). There will be one representative of Dash Caracas with us in the event. Alejandro Echeverria: 24 years old. He is the founder of Dash Help Venezuela, the first official support center for Dash (and any cryptocurrency) in the world. He is also advisor for some teams in the Dash Community like Dash Argentina and Dash Youth Venezuela. Dedicated himself to make profitable business models (Easymed, TuGruero- https://tugruero.io/, Ctrl+C-USB). DASH Forum/Discord: AlejandroE. Linkedin: https://www.linkedin.com/in/alejandro-echeverrria-b739b1101/). - Dash Caracas: led by Eugenia Alcalá (algodon.franelas). Dash Caracas has organized more than 6 Dash Conferences (Dash Caracas). There will be one representative of the team with us in the event. - Dash Help Venezuela: led by Alejandro Echeverría (AlejandroE). Dash Help Venezuela is the first support center of Dash (and any cryptocurrency) in the world. They have provided support and assistance in the Dash Caracas conferences, and they have solved more than 200 issues per event. Alejandro is our advisor and will be in the festival supporting us. - Dash Dinheiro Digital: led by Rodrigo (Rod Ambrissi). He will be one of the principal speakers of the event and will support us with a video recording of Dash participation in the festival. - Dash.red: Led by Edward (ec1warc1). 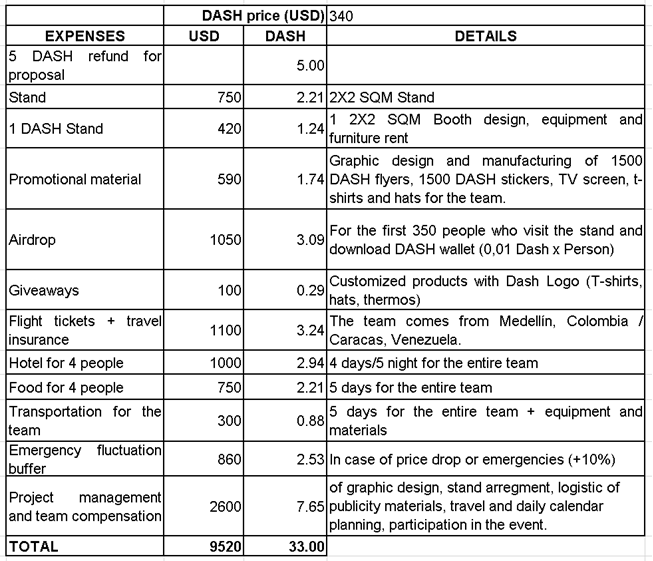 He provided the landing fee this proposal and we will promote dash.red games in our stand. Thank you very much for reading our proposal! What is your budget for the T-shirts, hats and thermos that you will be giving out? The budget for the giveaways is 0,29 Dash. We are thinking to giving up 3 T-shirts, 2 hats and one thermo. But like I say before, if Dash stays over the $400 we will order more giveaways. Are you planning on being an official 'Media Partner' or doing the 'Trademarks Stand' at the festival? The Budget in the proposal is to set up a 2x2 SQM stand (Trademarks Stand), but if the Dash price satys over $400 we will take advantage of this and we'll set up a stand of 3x3 SQM. Be sure you are putting a lot of emphasis on Dash's value in remittances. There are a lot of Venezuelans in Colombia, and they should be using Dash to send money home. I really like that you're coordinating with other successful proposals and helping us expand reach in to Colombia. Budget is reasonable relative to other conferences. Good luck! It's cool that you liked it. We really think that Dash Latin America has to be a united team where we take advantage of the successful proposals to push the Dash community to the moon. It does not make any sense that the proposals work separately. Representing Dash at conferences around topics like Blockchain, entrepreneurship, innovation, and technology, in general, should be a must. In my experience, the outcome of attending this sort of events is highly beneficial to the Dash project. Best of lucks to you guys! We hope this will be one of many events that we'll be promoting Dash in Latin America and all the other initiatives. I am working with this team with the advisory and also I will be representing Dash Help Venezuela in the event, I will provide support to users and also information about our services. Alliances between Dash teams in Latam will help our community a lot. We are really happy with your work as our advisory. A cryptocurrency festival in Colombia's capital city with approx "2000 young people" attending. The proposal looks reasonable with incentives to actually acquire a Dash wallet! Beyond development...we need educated Dash users with Dash wallets. Dash in hand. We are working hard to bring Dash to Colombian users and this is the first step for it. When the proposal is approved we will speak to the others merchants tha will attend the festival to be sure that they accept dash as a payment method, so the new users will be able to make real purchases with the Dash that we'll give away. I have been consulting Gianpaulo to get this proposal ready. Dash.red will be at the event and will be volunteering to help fulfill this proposal. I support Gianpaolo and Mireya's efforts and I am voting YES! Thank you! There are not enough words to thank you for all the help you have given us. We are very grateful for your support. I just bought tickets for me and Paula! We will be there! Hi Everyone, I was invited to Speak at this event and the Dash Community in Colombia put together this proposal to to sponsor this event. I 'll be bringing my Video Studio to create content for Dash Brasil and also all members from Dash Colombia will be there using the Studio as well to create content for Dash Colombia. Please support this proposal as we in Latin America are working together to make this happen. Cheers from Rod - Dash Brazil. Thank you for your support. My team and I are very excited to bring Dash community in Colombia. With you in the event I'm pretty sure it will be a very successful project. Thanks for the hard work. Any large crypto conference in Latin America should absolutely have a Dash presence. We are also building ground teams for the future. The price very fair for this considering the ground work and growth being accomplished. Thank You Mastermind, we are making this the first event of 5 and hopefully we will expend this event into another 5 country in Latin America. Hello Mastermined, thank you very much for your support! We really appreciate it. Looks good. You have my support.